Dr. David P. Gushee is our 2015 Perry Gresham Lecturer, coming to be with us on October 2-4. One of the foremost Christian ethicists of our day, Dr. Gushee will be addressing the question of the full inclusion of LGBT persons in the church. Friday, October 2nd is designed for clergy and church leaders, at which time Dr. Gushee will share strategies and best practices for leading a congregation toward full inclusion. The cost is $50 and includes continuing education credits. On Saturday Dr. Gushee will offer a presentation for the broader community, sharing with participants the story of his journey toward a change of heart and mind on full inclusion. The cost is $15. Both days include lunch. Dr. Gushee is Distinguished University Professor of Christian Ethics and Director of the Center for Theology and Public Life at Mercer University. Widely regarded as one of the leading moral voices in American Christianity, he is the author or editor of 20 books and hundreds of articles in his field, including Righteous Gentiles of the Holocaust, Kingdom Ethics, The Sacredness of Human Life, and, most recently, Changing Our Mind. Dr. Gushee has always accompanied his scholarly production with church work (First Baptist Church, Decatur), activism (human rights, creation care, LGBT acceptance), opinion writing (Washington Post, Huffington Post, Religion News Service), board service (Center for Victims of Torture, Sojourners), and domestic and global media consultation. Dr. Gushee has been married to Jeanie for 31 years. They reside in Atlanta. 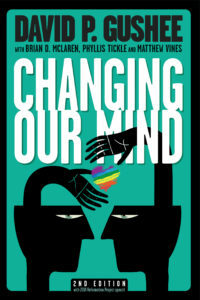 Dr. Gushee’s release of Changing Our Mind (Read the Spirit books) in late October 2014 added a new chapter to his scholarship and activism. In this book, Dr. Gushee makes a biblical case for a transformative rethinking of the LGBT issue and for the opening of all Christian hearts to full acceptance of so often marginalized and mistreated gay Christians in the life of the Church. Committed to sharing a message of acceptance that is deeply rooted in his faith, he is lecturing across the country. Counted among those events is the Perry Gresham Lectures at Central Woodward Christian Church. for information on registration contact the church office.